'Ever since I first set foot on rock at the tender age of seven years, climbing has been the most important thing in my life. In fact I would go so far as to say it is my reason for living and as long as I am able to climb I hope I will. It is from climbing I draw my inspiration for life.' On 14 June 1990, at Raven Tor in the Derbyshire Peak District, twenty-four-year-old Ben Moon squeezed his feet into a pair of rock shoes, tied in to his rope, chalked his fingers and pulled on to the wickedly overhanging, zebra-striped wall of limestone. Two minutes later he had made rock-climbing history with the first ascent of Hubble, now widely recognised as the world's first F9a. Born in the suburbs of London in 1966, Moon started rock climbing on the sandstone outcrops of Kent and Sussex. 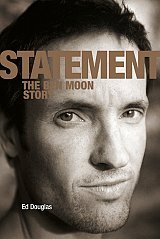 A pioneer in the sport-climbing revolution of the 1980s and a bouldering legend in the 1990s, he is one of the most iconic rock climbers in the sport's history, In Statement, Moon's official biography, award-winning writer Ed Douglas paints a portrait of a climbing visionary and dispels the myth of Moon as an anti-traditional climbing renegade. Interviews with Moon are complemented with insights from family and friends and extracts from magazines and personal diaries and letters.